Cardiff Bliss - Panoramic Ocean Views - Walk to Beach! 3 Bedrooms, 2 Baths, with amazing white water views! Wake-up to a breathtaking ocean view from your private patio and garden and take in the beautiful sights, sounds and smell of life at the beach. Fall in love with Cardiff-by-the-Sea, a romantic, surfing village with wonderful, unique beaches for walking, surfing and swimming. Quaint markets, restaurants, local joints and spas are all within walking distance for dining, shopping, exploring and relaxing. Enjoy the magical sunsets each night, and see why this cool town is fast becoming one of the most desired vacation areas of the world. This 3 Bedroom,(TWO Kings, 1 Queen) 2 Bath home is on the ground level, single story, part of a newly remodeled home located at the end of a private driveway in the heart of the famous Cardiff Composer District. This cozy and private oasis looks out over the Pacific ocean and is located only a block from the famous Pipes surf spot, and an easy walk to Swamis Beach, Seaside Market, beach side restaurants, boutiques, spas, shops. Approximately 3/4 mile to Cardiff State Beach or Moonlight Beach, and the revitalized downtown Encinitas. This beautiful and comfortable contemporary gem features granite counters, maple cabinets, stone tile, built in media niche with flat panel TV, gas log fireplace in the family room, a kitchen and dining nook area with a stove top, oven, microwave, dishwasher, refrigerator, ice maker and pantry. Enter through the expansive sliding glass door which opens two panels wide to truly bring the outdoors in. A huge outdoor private patio and garden is the highlight of this home. Enjoy the soothing spa jacuzzi , gas BBQ, deep seating couch and dining area. Watch TV outdoors on the 50' flats screen. Two built in overhead outdoor heaters keep you warm with the touch of a button on a cool night. Perfect for entertaining, enjoying barbecue, cocktails, reading, relaxing and viewing the incredible sunsets. This warm and inviting unit can sleep up to 6 people comfortably with 3 bedrooms. One bedroom has a brand new California King size bed, the other two bedrooms each have a Queen size bed. Parking includes 2 parking spaces. Amenities: Jacuzzi spa, gas log fireplace, flat-screen High Definition TV, Outdoor flat screen TV, cable with premium channels, DVD player, high-speed wireless internet, fully furnished kitchen with granite counter tops, microwave, dishwasher, refrigerator, ice maker, oven, stove top. All cooking utensils and linens provided. Additional amenities include a gas grill (BBQ), outdoor dining seating, games and books. No smoking and no pets. Conveniently located for easy access to both the coast highway and the Interstate 5 freeway, you are 10 minutes from the famous Torrey Pines golf course, the quaint village of Del Mar and famous Del Mar Racetrack, and only three miles from the beautiful and eclectic Solana Beach, with boutiques, shops, restaurants, and fantastic nightlife (Belly-Up Tavern for live music) all located in the revitalized Cedros District. You can also walk to the Coaster train station to catch the Coaster downtown or to Petco Park to catch a Padres game. Only a 25 minute ride from the airport and the downtown Gas lamp quarter, world famous zoo and historic Balboa Park and museums. 35 minutes to beautiful Coronado and famous Hotel Del Coronado. Sightseeing and Highlights: Buick Open Golf Tourney (January), Del Mar Racetrack (July – August), and Fairgrounds (June), San Diego Zoo and Wild Animal Park, Balboa Park and Museums, Sea World, Lego land, Stephen Birch Aquarium, Seaport Village, San Diego Gaslamp District, La Jolla and Del Mar Villages, Old Town, Carlsbad Outlet Center and Flower Fields. Disneyland, Knott’s Berry Farm, and Anaheim are only 1 ½ hours away. There are several local beachfront restaurants for sushi, fine dining and quaint coffee houses for reading and relaxing. Shopping is everywhere, at local boutiques, outlet and outdoor malls. Amazing health and beauty spas are plentiful including the newly remodeled La Costa Resort. Sometimes known as the Yoga capital of the world, there are so many studios to choose from. You can also enjoy live theater, cinemas, Padres and Charger games, Concerts, live music, or the energized nightlife of the downtown San Diego Gas lamp Quarter. ***NEW - pedestrian underpass to beach just 3 blocks from our home at Santa Fe to Swamis. Walk to beach in about 8 minutes without crossing over the train tracks. We are down to earth, fortunate, San Diego natives who love the laid back lifestyle and the hip new vibe in Cardiff by-the-Sea. We are proud to have a home here. We love to get away to the mountains in winter and enjoy an active lifestyle of sports and travel. Family, good friends, and good health are our highest priorities. Our dream was always to own a home by the beach – to enjoy those stunning sunsets, wild surf, runs at low tide, and the hot sand between your toes….I was fortunate enough to make that a reality in 2006. The views are stunning and are never the same- i never get tired of seeing the dolphins cruise by or hearing the surfers each morning! We overlook Pipes Beach and can see and hear the surfers. 200 feet from the Ocean. We have unobstructed ocean views with no neighbors between us and the wonderful views of the Pacific Ocean! Perfect for relaxing and watching sunsets around the fire pit. My family had a wonderful stay and vacation!!! The property was very clean and inviting. The beds were SO comfortable, the kitchen had all of the accessories/utensils needed to cook daily, laundry was very convenient. The hot tub that overlooked the ocean was amazing. In the evenings, the heaters on the patio were perfect while watching a movie on the large screen TV. Whatever we needed was provided. Perfect vacation for us!!! Perfect arrangement for our girls weekend. Property was clean, comfortable and was just as pictured. The view is beautiful and we very much enjoyed our time here. Would absolutely come back. My one critique (and it would be true for many VRBO properties) is I find the $250 cleaning fee to be excessive. The place is small and easy to clean and I think the price should be lower. Especially since we were expected to take out the trash, run the dishwasher and wash towels. I absolutely feel that for $250 we should not have had to do any of that. Other than this small criticism, that I am lodging on principle, the property is absolutely lovely. Thank you so much for taking the time to write a review. We are so glad you had a wonderful time. We want our guests feel like they are on vacation and appreciate your feedback. To clarify what our cleaning fee covers, we do not ask guests to run the dishwasher or wash bath towels on their departure. Trash needs only to go a few steps to the large cans. We look forward to having you back again. Patio very nice. Hot tub worked. Heat lamps worked, allowing us to eat/hang outside, in winter. Manager responsive during stay. Large bed was comfy, with just the right weight duvet. Fireplace worked. Laundry worked, very convenient. Pleasing vegetation around patio. Clean. Nice vacation! The good: The location was great. Bedrooms work very well, and most of the time was spent on the patio which is amazing. Was nice to have sports equipment for the kids. The bad: The kitchen was sub standard, lacking silverware and the two food prep knives were very sub par. Pots/pans were a bare minimum and bottom of the barrel quality-wise. All the bathroom fans, including the separate upstairs apartment are very loud and could be heard by all. Bath towels were few and needed to be washed daily. A beautiful view that was close to everything. It was perfect for the 6 of us. A great outdoor space where we spent almost all of our time. The house had everything that we need. Simple with a friendly owner and house manager. We booked Cardiff Bliss as a place to stay for my wife's son's wedding. It was a great choice. 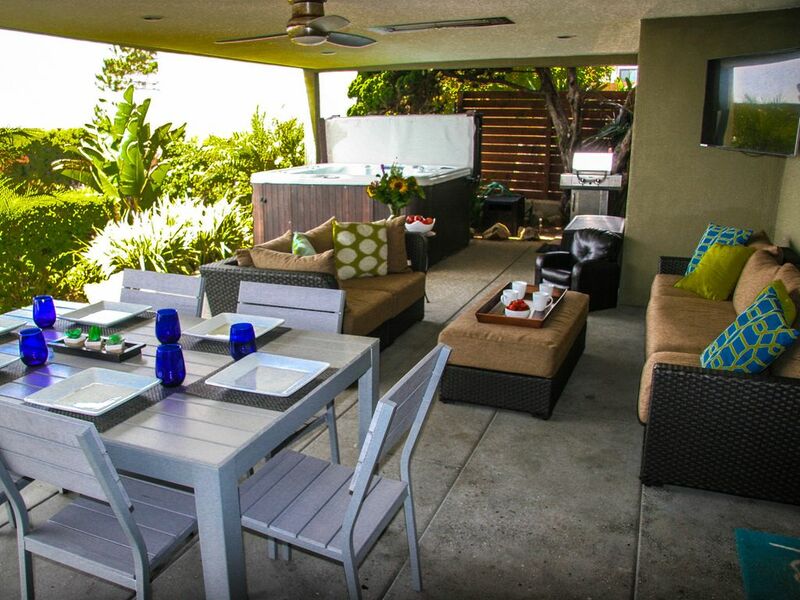 Plenty of room, great location and an amazing outdoor space with sweeping views of the pacific. We really enjoyed our stay the owner was very friendly and the home has plenty of amenities; a hot tub, surf board, beach chairs, boogie boards, all u need to enjoy the coast and beaches along the pacific. Legoland (10 minues away), Sea World (20 minutes away) the San Diego Zoo (25 minutes away) and Wild Animal Park are awesome attractions enjoyed by children and adults. We hold annual memberships to Sea World and Zoo/Wild Animal Park because we enjoy them so much! We are also 5-10 Minutes from Del Mar Horse Track, fairgrounds and Torrey Pines Golf Course. There are several golf courses within 15 minutes from our home. Stephen Birch Aquarium is great. La Jolla, Downtown San Diego and historic Gaslamp district are also popular. Balboa Park, museums! Hiking trails on the coast at Torrey pines. There are so many activities and attractions to choose from, picking is the most difficult part. Also, Disneyland/California Adventure Park and Knotts Berry Farm are only a 1.5 hour drive North. We collect a REFUNDABLE Security deposit of $500 on your arrival date. If you have any rate questions, please do not hesitate to contact us via phone or email.